As if we didn’t know Mobile was booming already, Google and others in the industry released some numbers that overwhelmingly confirmed that point. For example, this past week Gartner released a study that found over 428 million mobile devices were sold in the first quarter of 2011. Yes, that’s 428 million, just in just one quarter. Also, at Google I/O this year, Google revealed that 400K Android handsets are being activated daily. Yes, per day. Both statistics are incredibly powerful, and they do make sense when you break it down. Mobile, and more specifically smartphones, provide incredible functionality and ease of use, enabling people to take mini-computers with them wherever they go. Smartphone adoption and growth has led to the mobile app boom we have seen over the past few years. As users flock to smartphones, developers also flock to build apps for them. As the iPhone took off, developers started building thousands of iPhone apps. Now, as Android booms (surpassing the iPhone in market share), developers are building more and more apps for devices running Google’s mobile OS. Again, this makes complete sense, business-wise. Go where the users are. There are currently hundreds of thousands of apps available across iPhone and Android. But, just because you can build an app, doesn’t mean you should. There are obviously many apps that are useless. Some don’t work well, others provide very little functionality, etc. With the incredible low cost of entry, and low risk, you could build an app just for the heck of it. Then there are also loads of games, which fill an entertainment void that was present on most feature phones (AKA dumbphones). Based on what I’m explaining, you are left with thousands and thousands of apps, some of which are valuable, while others are just taking up (digital) space. Not only will Flixster give you new releases, but you can search for any movie that’s contained in the database (pretty much any movie). So, the app covers any user. 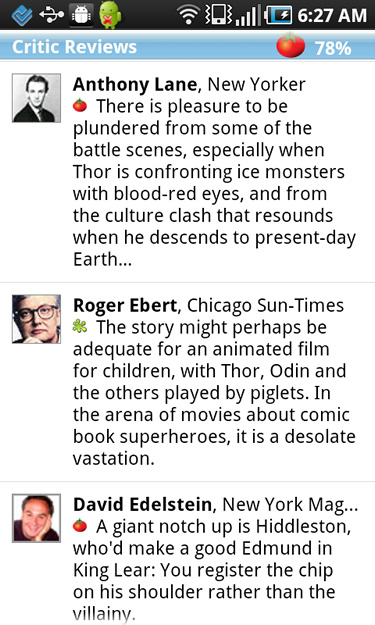 The reviews are provided via Rotten Tomatoes, which aggregates reviews from across many sources. 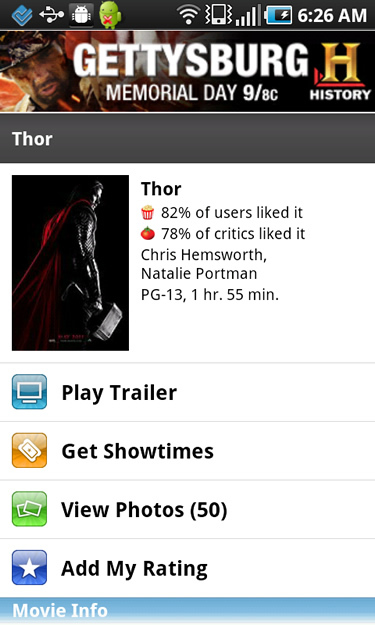 With Rotten Tomatoes, you can quickly view the “tomatometer”, which scores each movie based on the reviews (0-100 score). I’ve found this typically gives me a great feel for how the movie is. You can see screenshots below from the app. Now that I’ve covered what the apps does, let me break down the core reasons that I believe it’s the ultimate app (from a marketing and business standpoint). It really comes down to a few core reasons, which include incredible functionality (providing value), effortless usability (making it easy for users), and commerce (the ability to complete transactions easily, while giving Flixster the ability to generate revenue). I’ll briefly explain each below. I covered some of this earlier, but the app does exactly what you need it to do, and more. I can’t remember a time that I searched for a movie (no matter how obscure), and didn’t find a boatload of information about it via Flixster. The combination of rich information, movie reviews, video trailers, box office information, etc. give movie fans everything they need. The app is ridiculously easy to use, laid out extremely well, and has incredible performance. If you own a smartphone, then you have probably come across some apps that are slow, bomb all the time, etc. Flixster has never failed me performance-wise. It’s organized well, and even enables you to buy tickets in mere seconds. More on that below. Flixster is a free app, which greatly helps with adoption. But make no bones about it, there is a serious commerce aspect to the mobile app. 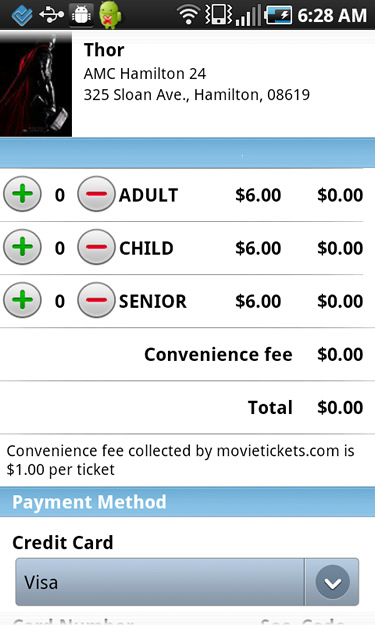 I’ve mentioned the ability to buy tickets via Flixster, and it’s a great addition to the ultimate app. 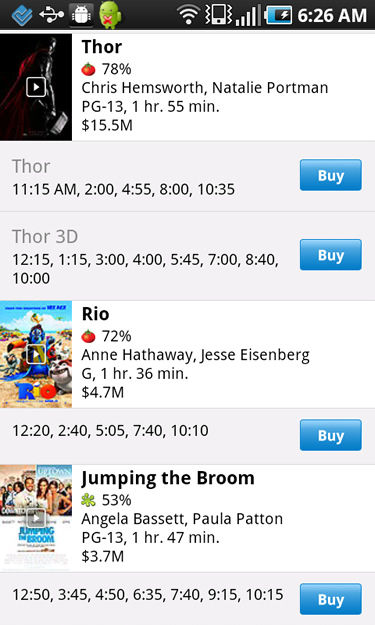 From any movie page, you can quickly check movie times at theatres located near you (GPS-wise). You can also enter a location to find movies in an area not close in proximity. Once you are ready to buy your tickets, the app seamlessly enables you to go through the process of selecting the number of tickets, entering your credit card information, and completing your purchase. You are immediately sent a confirmation email and you can be off and running in less than a minute or two. You need to try this out to appreciate how elegant of a solution it is.